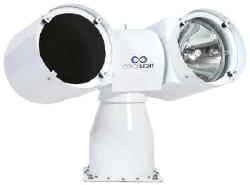 The CLUV25-12 model features a combination 400W high CRI/high CCT (6000K) "daylight" light and a special frequency UV-light for obscure conditions (e.g. snow, rain, fog) and /or oil spill recovery operations. Each lamp head can be operated independently, including focus adjustment, or synchronized together for maximum output. The CLUV25-12 is constructed of robust acid-proof stainless steel. The internal components are digitally controlled and monitored and the brushless digital controlled motors equate to no planned maintenance the first 10 years of operation! This model comes complete with a compact 100-240V electronic box, OP3G bridge panel remote control, 3m (10') power & bus/signal cable, and 5m (16.5') control cable.The CLUV25-12 UD is specific for upside down mounting. Like the standard CLUV25-12, it features a combination 400W high CRI/High CCT (6000K) "daylight" light and a special frequency UV-light for obscure conditions (e.g. snow, rain, fog) and/or oil spill recovery operations. 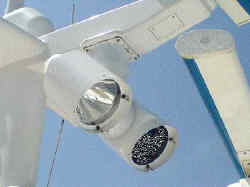 Each lamp head can be operated independently, including focus adjustment, or synchronized together for maximum output. The CLUV25-12 is constructed of robust acid-proof stainless steel. The internal components are digitally controlled and monitored and the brushless digital controlled motors equate to no planned maintenance the first 10 years of operation! This model comes complete with a compact 100-240V electronic box, OP3G bridge panel remote control, 3m (10') power & bus/signal cable, and 5m (16.5') control cable.